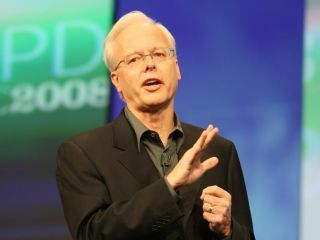 Ray Ozzie: Microsoft can deliver "a complete experience across phone, PC and web"
Ray Ozzie yesterday showed Windows 7 to the world at the Professional Developers Conference but recovering from the Vista malaise might not be the most important development he's presiding over at Microsoft - synchronizing Windows Mobile devices through Live Mesh and putting Office 14 (the follow-up to Office 2007) applications on the web could be more significant than a new version of Windows. Steve Sinofsky and another ex-Office executive, Julie Larson-Green, demoed the new user interface in Windows 7 and highlighted some other features that drew applause: multi-monitor support for projectors; ODF support in WordPad as well as Microsoft's own Open XML format from Office 2007; customizing which kind of shutdown you want on the Start menu; mounting and creating VHD images directly in Windows; and more DirectX graphics effects that are faster because they're hardware accelerated on the GPU, including 2D graphics, animation and text effects. That's what AutoDesk is using for its MudBox application that uses multi-touch to let artists sculpt a 3D model on screen as if they were working with real clay. The keynote showed that it matters that it's the Office team taking over Windows. Not just because Sinofsky has made Office ship regularly and work well, but because the user interface changes in Windows 7 are similar to the Office 2007 ribbon - they're all about making the features that are already there easier to work with and new features easier to find because they're in a logical place. As important as the features was the acknowledgement that Vista wasn't what it should have been, but rather than blaming hardware and software partners, Sinofsky concentrated on what the Windows team has done to solve the problem. "We have to do what engineers do: we build the product and then we take a step back and ask 'what did we learn?' and build on all those experiences; that's what engineering is." One thing they learned was that performance needed improving; "We thought it would be a good idea to reduce the memory footprint of the core Vista install; we thought it would be a good idea to improve the performance of the Desktop Window Manager." To prove that, he showed Vista running on his personal 1Ghz, 1GB netbook (which he referred to later as 'just one of them' but looked like the Lenovo S10 to us), and claimed that even with the un-optimised pre-beta version "when Windows 7 has finished booting, today I still have about half the RAM available." To have the most exciting features in Windows 7, like multi-touch, take off, lots of applications need to support them, not just demonstration apps like a world globe you can zoom into and a game you can play with both hands. Tesco is using touch to drive a shopping list application that shows you recipes, family photos and 3D images of Christmas cakes. As this is a developer conference, Microsoft also showed the tools for adding touch to a photo application, along with the ribbon and Jump Lists - and then turning it into a photo sharing tool that looks up your friends on Live Contacts and sends them your photos through Live Mesh. Mesh is moving from a preview tool for simple files and folders to a way of connecting people and preferences and content. Anthony Rose from the BBC showed off a 'proof of concept' version of iPlayer, written in Silverlight, that tracks what programmes your friends have watched and rated. Pause a program half way through because you have to leave the house and you can carry on watching it on your phone exactly where you left off (the Live Mesh client that enables this will be available at the end of the week).